NFL team jerseys don’t change much every year. Modifications might include a few fabric upgrades and slight color changes, but that’s about it. However, ever since Nike got a hold on the license to make all NFL jerseys, the sportwear giant has been making a lot of cool changes. That trend continues this season with these new special edition monochromatic team jerseys. 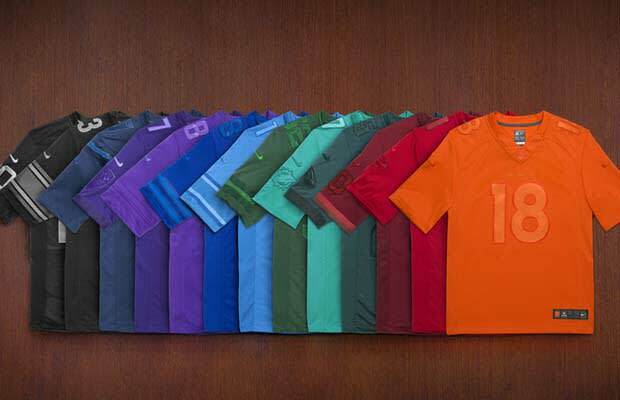 The uniforms are stripped down to each team’s base color but all embroidery, numbers, and current player names are still intact. Of course the current Flywire technology was incorporated to help keep your body cool when you’re out throwing the pigskin. Trust us, you’ll be the coolest guy at the tailgate when you show up with these on. Check out all Champ Sports locations on August 28 for the release date. Just in time for NFL season.